Mizpah-Faith Lodge merged here in 2008 (2008-29). By Wor. George Manson McCallar. At the Fiftieth Anniversary of Charity Lodge, A.F. & A.M., March 24, 1919. I am just going to tell you some news. Charity Lodge is fifty years old. You may not have heard of it; you may not believe it. She doesn't look it, but it is true. Her records show it. They are like the birth page in the family Bible. No use to dispute them. At that, Charity is the youngest Masonic lodge in Cambridge. Its first record is February 24, 1869, when a meeting of petitioners for a Masonic Lodge in North Cambridge was held to hear a report of a committee of three who had taken the petition to Mount Olivet Lodge, then meeting in Old Cambridge, for its recommendation. Mount Olivet voted this unanimously. The petition was presented to the Most Worshipful Grand Master by Right Worshipful F. Lyman Winship, District Deputy Grand Master for the Fourth District, and Charity Lodge was on its way. In due time a Dispensation was granted, dated March 6, 1869, and a business meeting was held May 17 to arrange for work under that Dispensation and in which the Lodge was named Charity Lodge, and Dr. James R. Morse appointed as first Master, William H. Bailey as first Senior Warden, and D. Gilbert Dexter as first Junior Warden. A vote was taken at this meeting which indicated the methods of its originators, "that the Treasurer be authorized to borrow $1,000," on the credit of the Lodge, and that not being sufficient to pay the expense of starting the Lodge they later passed other votes of the same nature. To look back fifty years it does not now seem that the collateral was very valuable, but they got the money. However humble their station in Masonry they were High Priests in finance and they borrowed until the Lodge was in debt nearly $3,000. "'Tis true 'tis pity; pity 'tis 'tis true." On account of this debt the first years of the voyage of Charity Lodge were "bound in shallows and in miseries." It was not so bad while the skies were clear, the sun shining, and the seas smooth, but in the great Boston fire of 1872 some of its chief sponsors were among the unfortunates. The panic of 1873 soon followed and the community of North Cambridge, which had enjoyed quite a boom in real estate and building, was hit hard by falling values, and dark clouds gathered around the recently established Charity Lodge. but it fell not, for it was founded upon a rock." By strict economies, contributions, and what are now called "drives" among its members, it gradually reduced its indebtedness and a report was made December 27, 1875, that with the cash on hand and to be received from dues during the coming year Charity Lodge would be free from debt. Since that time the Lodge has been conducted on a "pay as you go" basis, but the Lodge grew slowly. Some years only three or four additions were made, and it was years before a permanent fund was started which even now has only assumed respectable proportions. If a Lodge gives value received to its candidates and members for the money paid by them, it seems hardly possible for it to become wealthy except by gifts or bequests. Charity Lodge in its fifty years has had one bequest of one hundred dollars, made by a good Brother who died years ago, but when his estate was settled there was nothing left to pay the money. However that need not frighten the wealthy Brethren of the Lodge. But Charity Lodge is rich. In gold and lands T Perhaps not, but rich in those things which money cannot buy — rich in its friends here this evening. Lord Byron's famous "revelry by night" party could boast of no fairer women or braver men than are here tonight. Rich in its memories, its associations, and its friendships; rich in its strong and vigorous membership; especially rich in its young men. Look at that service flag. It tells its own story, that about one hundred of the finest boys in the world have gone forth from Charity Lodge conquering and to conquer. Would you sell that flag and what it represents for money? Charity Lodge would lose if it exchanged it for the wealth of the whole world. Thank God there is but one gold star. It is in memory of Brother Arthur Ardis, a very quiet and unassuming member who could not often meet with us, but when he did he was always found in the Lodge-room listening to the work and not in that favorite perch of so many of us—the smoking room. As a member of the National Guard he went to the border. Returning he enlisted in the Canadian Volunteers and went overseas, dying in London June 29, 1918, a sergeant in the Canadian Engineers. The Lodge was constituted March 28, 1870, by Most Worshipful William Sewall Gardner, then Grand Master of Masons in Massachusetts, accompanied by Right Worshipful Charles Levi Woodbury as Deputy Grand Master, Right Worshipful Samuel C. Lawrence as Senior Grand Warden, Right WorshipfulIvory H. Pope as Junior Grand Warden, Worshipful Henry Endicott as Grand Treasurer, and Right Worshipful Solon Thornton as Grand Secretary. In the presence of about eighty Brethren the officers of Charity Lodge were installed, and no doubt the Marshal proclaimed that Charity Lodge was "prepared to act on any business which might regularly come before it." After the ceremonies were concluded, it is recorded that the company was invited to a collation at Porter's Hotel. To those of you who only knew Porter's Hotel in its later and decadent days it may not seem much of a place for a Masonic Lodge to patronize for such services, but in its earlier days, in the days of the Cambridge cattle market and when the old race course, which was located a short distance above here and which held free-for-all horse trots Sunday afternoons—"those were the happy days" when Porter's Hotel was an institution known far and wide for furnishing the best of food to the hungry and perhaps drink to the thirsty, and it has left its name in this vicinity on Porter Station, Porter Square, Porter Street, Porter Road, and I have no doubt there are those whom our late Brother Roosevelt characterized as malefactors of great wealth who are still enjoying the Porterhouse steak. There were fourteen charter members whose names are printed on your programs, not one of them now living. The Lodge buried with Masonic honors Brother Darwin A. Proctor, who died in Arlington May 31, 1906, and Worshipful Leander J. Wing, our last surviving charter member, who died in Lexington September 15, 1915. During the life of the Dispensation they made twenty members. Two of these are living and are members of the Lodge, Brother Thomas T. Ferguson and Brother George F. Wright. Others who became members in its early days and are now living are: Brother Allen F. Carpenter, April 3, 1871; Brother Dr. E. H. Stevens, January 1, 1872; Brother Henry H. Freeman, March 13, 1873; Brother C. W. Ingalls, September 1, 1873; Brother Henry F. Whitney, June 1, 1874; Brother A. E. Long, October 5, 1874. The descendants of the charter members are not numerous in our present membership. Brother Henry H. Freeman, one of our oldest members, is almost a descendant, having married the daughter of Brother D. A. Proctor. Brother Adna B. Shaw is the son of Brother Dan W. Shaw, our first Treasurer. Brother Clarence A. Proctor and Brother Charles A. Proctor are sons of Darwin A. Proctor, our first Secretary. One solitary grandson is Brother Percy M. Proctor, son of Brother Charles A. Proctor. But, Brethren, "hope springs eternal." There is already one great-grandson in that family who I hope will at his majority affiliate with the Lodge of his great-grandfather, and three great-granddaughters who can join the Eastern Star. The Lodge has had twenty-nine Masters, fourteen of whom are now living, whose names and service are printed in your programs. Worshipful James B. Hilton has come more than a thousand miles and Worshipful Frank Hayden more than two hundred and fifty miles to be with us tonight. I date far enough back to have known them all person ally except Worshipful Brother Morse and Worshipful Brother Richardson, who died before I became a member of the Craft. I want to testify to their ability, fidelity, and interest in all matters pertaining to the Lodge. We of today sadly miss the counsel and advice of those who have passed away in recent years, who labored shoulder to shoulder with us in the work of the Lodge: Right Worshipful John E. Parry, Worshipful John E. Ricker, Worshipful Walter H. Lerned, Sr., and Worshipful Edward Leroy Pierce. We often find ourselves looking for them in their accustomed places in the Lodge-room and listening to catch the sound of their voices now silent forever. The Lodge has had five Treasurers. Brother Dan W. Shaw, Worshipful Francis M. Mason, Worshipful John E. Ricker, Worshipful Walter H. Lerned, Sr., and the present Treasurer and ranking Past Master, our God-blessed Worshipful Brother Charles M. Pear. It has had six Secretaries: Brother Darwin A. Proctor, Brother Alonzo R. Smith, Brother Thomas T, Ferguson for twenty-five years, and who is with us as a guest tonight, Brother John L. Blake, Worshipful James B. Hilton, and the present Secretary, Worshipful George M. McCallar, all living but two, Brothers Proctor and Smith. Secretaries are necessarily of a tough fibre. The Lodge has met in North Cambridge all of its life, but in four different places. First, in the old hall called Unity Hall, just below here on the bridge; in 1879 it moved to what is now known as Fraternity Hall, corner of Massachusetts Avenue and Russell Street; in 1893, as tenants of the Mount Sinai Building Association, to the new building, corner of Massachusetts Avenue and Walden Street. This building was finely fitted up with every convenience for.Masonic work. The relations of landlord and tenant were ideal. There we celebrated our twenty-fifth anniversary in a very mild way. During the evening of the celebration we made our one hundredth member. We were doing a fair amount of work, gave a free ladies' night to the members every year, were at peace with our neighbors and the whole world with none to molest us or make us afraid. But "woe to them who are at ease in Zion." In 1905 the Union Hall Association, which owned the building where Amicable, Mount Olivet, and Mizpah Lodges met in Cambridgeport, sold its holdings to the Cambridge-port Savings Bank, who were to tear down the old buildings and build the new building now occupied by the Cambridgeport Savings Bank and Harvard Trust Company, and those Lodges decided to procure apartments in the Mt. Sinai building in North Cambridge. Putnam Lodge, of East Cambridge, followed them and it was a serious question for Charity Lodge if a community which had indifferently maintained one Masonic Lodge would support five, and whether the older Lodges with their larger memberships and stronger organizations would not overwhelm Charity Lodge. I remember hearing one influential member of one of the other Lodges sympathetically say, "Poor old Charity; too bad." However, we never had to cross that bridge. Instead of taking away what we had they brought us what we had not had before, an equal opportunity in the rest of the city, and Charity Lodge prospered as never before, increasing from a merely local Lodge to one of large membership. When this new Temple was proposed it joined with the other bodies in its erection, and we are back within a few steps of where we started fifty years ago; but our position has been changed from the smallest to the largest Lodge in Cambridge, and the difference in its apartments compares with the difference in its position. In 1969 will this Temple be as far behind the times as Unity Hall would be if standing today! Charity Lodge has started on its second fifty years, but prophecy is not one of my duties. We have many young members and in the ordinary course of nature it is more than possible that some of them will be present at its one hundredth anniversary. By Worshipful Robert A. Parry. On February 24, 1869, a meeting of petitioners for a Masonic Lodge in North Cambridge was held to hear a report of a committee of three, who had taken a petition to Mount Olivet Lodge for its recommendation.. Mount Olivet Lodge voted unanimously in favor, and the petition was then presented to the Most Worshipful Grand Master by Right Worshipful F. Lyman Winship, who was then District Deputy Grand Master for this District, and Charity Lodge was on its way. A dispensation was granted on March 6, 1869, and on May 17th a business meeting was held to arrange for work under that dispensation. The first work was to select a name and "Charity Lodge" was chosen. Dr. James R. Morse was appointed as the first Worshipful Master; William H. Bailey as the first Senior Warden and Dr. D. Gilbert Dexter as the first Junior Warden. The Treasurer was authorized to borrow One Thousand Dollars on the credit of the members, and that amount not being sufficient to pay the expenses of starting the Lodge, it was increased by later votes to Three Thousand Dollars. Charity Lodge was constituted March 28, 1870, by Most Worshipful William Sewall Gardner, who was then Grand Master of Masons in Massachusetts, in the presence of about eighty Brother Masons. Officers were installed and Charity Lodge was prepared to act on any business that might regularly come before it. During the period of dispensation, twenty members were added to the membership. The great Boston fire of 1872, and the financial panic of 1873, were disastrous to many of the sponsors and dark clouds gathered around the recently established Charity Lodge, but nevertheless it survived, for it was built on a solid foundation by men of sound judgment and exceptional ability. By strict economy and contributions from its members, it gradually reduced its indebtedness, and a report on December 7, 1875, showed that with cash on hand and dues to be received for the current year, Charity Lodge would be free from debt. At that time, Charity Lodge began and has continued on a "Pay as you go Policy." We have had few bequests, but one outstanding is that of our late Brother William L. Lockhart, of a substantial amount in gilt-edge securities, the income to be used only for the relief of needy Brothers and their families. Charity Lodge is rich, however: perhaps not in gold and lands, or in those things that money can buy, but rich in its friendships, its memories, its associations, and especially rich in its young members and in its strong and vigorous membership. Our Service Flag in 1918 had many members, composed of some of the finest boys in the world, and our present Service Flag has many members of the same calibre. There are not many descendants of the Charter Members now in the Lodge membership. We have had fifty-three Masters, twenty-eight of whom have passed on, and twenty-five who are still active members. We have had six Treasurers, two of whom are living, Worshipful John A. MacFarland, our present Treasurer, and Treasurer Emeritus Right Worshipful Lester M. Bacon, and seven Secretaries, one of whom is living, Right Worshipful Thomas E. Baker, our present Secretary. We have held our meetings in North Cambridge during all the seventy-five years, first in Unity Hall, just south of Porter's Bridge, second, in Fraternity Hall in 1879, at the corner of Massachusetts Avenue and Russell Street, and third, in 1893, in Odd Fellows Building, at the corner of Massachusetts Avenue and Walden Street. In 1905 the building where most of the Cambridge Masonic bodies met was torn down and the Lodges decided to secure apartments in the Odd Fellows Building where Charity Lodge met. Charity Lodge felt that this was a serious blow. Could a community which had maintained only one Lodge support five other Lodges? Charity Lodge prospered, however, as never before. When the building of the present Temple was proposed, Charity Lodge joined with all the other Masonic bodies, and by good management and fraternal co-operation, this beautiful Temple is owned wholly by our Cambridge Masonic bodies. It is worth mentioning that Charity Lodge now meets less than five hundred feet from its first meeting place. It has prospered for seventy-five years and we can hope that the same measure of success will continue so that on our One Hundredth Anniversary, it will be found at the front of every good word and deed. Charity Lodge has demonstrated to the Craft and to the world "how good and how pleasant it is for Brethren to dwell together in Unity." In conclusion, let us ask, humbly and with reverence, that the Wisdom of Almighty God guide and direct the future of our beloved Charity Lodge. Charity Lodge's ceremonies, during this year, are acts of reverence and gratitude to our predecessors. The work of these Masons, is benevolence performed during two long life spans. So it is that the officers of Charity Lodge are charged by the past to engage the brethren with a story of events and circumstances that brought about the Masonry of Charity Lodge. Three new Masonic Lodges opened in Cambridge within six years: Mount Olivet in 1863, Mizpah in 1865 and Charity in 1869. Cambridge Royal Arch Chapter came in 1865. Our Country suffered when ridding itself of slavery; parts of this Country experienced devastation and extreme poverty for some years. Massachusetts people agreed on deliverance of the Afro-Americans from slavery. People wanted complete freedom and full citizenship for them; and yet, the Country imprudently crippled them, economically and socially. In the Civil War, brother killed brother. After the war, family turned from family. The prevalence of fear and hate, aroused thoughtful people. People talked about what kept peace and happiness out of the land. Mindful of the times, aware that the Country struggled against poverty, fear and hate, living in a city of three communities with tendencies to encroachment, the founders in step with social betterment, suggested Charity as the name for their new Masonic Lodge opening in North Cambridge. Cambridge Masons reflected the general striving for excellence prevailing from coast to coast, shown in the work of writers, musicians, singers, actors, teachers, clergy, architects, engineers, artists, athletes, bankers, builders, whatever there was in the greatness of the United States. Much of this striving pressed in on Boston and Harvard, to the immense profit of Cambridge and the growth of Masonic Lodges. Rare the communities promising better candidates for Masonry. General prosperity caused homes to crowd into the upper part of Cambridge, north and south of the railway station, about the big Henderson Carriage Factory, the brick yard and Hewes Pottery. The Baptists and the Episcopalians, or the Irish and the Canadian French, crowded the cattle out of North Cambridge into Brighton and elsewhere; helped by Western beef and refrigerated railway cars. The Baptists built their North Avenue Baptist Church, the Episcopalians their Free Church of Saint James; by chance balancing the future complexion of our Lodge, off and on with the Congregational Church, supplying Lodge Chaplains. A community where everybody on the street greeted Longfellow, Holmes, Emerson, Lowell, Eliot, and one another by name, augured well for the North Cambridge Masons and Charity Lodge. Long after the war, camp songs lingered; people sang them as folk songs; and the brethren sang them at their dinners. The public wanted song, music, picture, poetry, theatre, spectacle, or athletic display. Boys and girls submitted to the rigors of becoming teacher, writer, artist, singer, athlete, or member of a professional society. Farming, railroad transportation, medicine, engineering, architecture, industry, finance, communications, commerce, law, and education saw vast new horizons. Men gave of their money to build town halls, libraries, schools, churches, hospitals; or they established charitable foundations. During Charity Lodge's early years, a new world opened. Some of the Maine boys, who trudged in the cattle drives, later settled in Cambridge to find schooling or employment. Cousins from Canada, separated from New England by a great-grandfather's loyalty, merged smoothly in Massachusetts with the parent stock. Now and then, country people from random villages in eastern states, settled in Cambridge. These had family backgrounds wherein Puritan standards prevailed. German and Scandinavian, along with Scotsman and Irishman, likewise put down roots. These people joined church congregations. Railway, factory, local and Boston banks, business and government furnished gainful employment. In the next generation, the sons and daughters taught school, entered the learned professions, worked as nurses, bank clerks, in city hall, in clerical or supervisory jobs, at their own enterprise, or almost any place. On these people Charity Lodge drew candidates for Masonry, throughout a hundred years. Older Masons in Charity Lodge fixed in the memory of some living members stories from the Chicago fire, the Epizootic, the Boston Fire, the Panic, Custer's Last Raid, factory conditions, and the lynchings in distant states. These events spilled major trouble on many Masons and their friends. Charity Lodge members talked much about the Boston Music Hall, the theatre, sing-songs around the home piano, about education, M.I.T., church activities, and evening schooling, about Lindbergh, Boston redevelopment, Expo '67, athletic excellence, reform government with Cambridge Plan E, Florida, baseball, hockey, swimming, skiing, and a Maine wonderland. These afforded much pleasant talk and thinking for our Lodge members. The first members of Charity Lodge lived in a time of memorable events. Remote happenings chained some of them into inability to pay their way in the Lodge. In that day, prosperity or ruin occurred commonly; ruin hung overhead with domino ability to knock over neighbor. In that day, government controls and managed economy neither assured, nor insured, home ownership or financial stability. After the founding of our Lodge, members were troubled by fire, financial panic, and exploitation. Later, other members were troubled by news of the San Francisco earthquake, the Titanic ramming an iceberg, the sinking of the Empress of Ireland, the Chelsea fire, the Halifax explosion. Later, other members were hurt by two great wars. At the time, some Lodge members were asked to go to the aid of sufferers, or to give alms, or to give their lives. To govern their present thinking, older minds have memories of a depression lasting ten years, memories of years of war prepared by older people; and they incur hurt from devaluation and inflation absorbing savings accounts. Though modern values are not precisely those of our fathers, there is sufficient virtue in every member of Charity Lodge, to praise our founders for selecting a name as portentous as Charity, and to experience vicariously some hard occurrences and moments of greatness of man, happening for or to the brethren of Charity Lodge. Charity Lodge membership kept pace with the good will in the community and the climb of benevolence. In 1928, Charity Lodge, A. F. & A. M., numbered 957 members. Fall off in membership paralleled enrollments elsewhere and reflected more country living, shifting population, young men in great numbers attending evening school for three, ten or more years. Dourness on our part never helped membership or lodge attendance. Charity Lodge members belong to Chamber of Commerce, or Service Club, learned society, or employee union. Members exchange ideas in the shadows of Northeastern, Boston University, Suffolk, Massachusetts Institute of Technology, and Harvard, whether student, employee or visitor. The brethren live and interplay in the Cambridge and Boston community. The brethren normally maintain a stream of right thinking, strongly tinged with benevolence. In Cambridge, congregations of Roman Catholics increase phenomenally; but, love is a phenomenon, love crosses fences. Some members of our Lodge marry Roman Catholics; some Roman Catholics join our Lodge. Church disobedience invites penalty, hurt, trouble and dourness. Whenever an injured brother privately discloses his injuries, a practical brother reminds him that his Lodge Card bears the word Charity; that though leading with the chin wins something for the other fellow, a Mason in adversity trots out his benevolence. The year of Rum, Romanism and Rebellion came in 1885 and met with chilling frost. The Craft talked seriously about charity and benevolence; and people still remembered the Legislature's "clownish investigation of Catholic schools and convents", three decades earlier. Charity Lodge's fifty-nine members easily stuck to Lodge habit of abhorring bigotry and racism. Tolerance and charity practiced in Cambridge, even during the years of the Church Militant. When the Cardinal Archbishop of Boston, as honored guest in 1965, visited Brotherhood Lodge, A. F. & A. M., and this year made the invocation at a Shriners' public ceremony, estrangement found itself far out of date. In 1969, we in Charity Lodge are alive to what happens any place. The people of our Country, in many areas, are on dizzy heights. Our living and our technology are somewhat parallel to our geography. Technology is advanced to space flight. Society is slow to correct injustice. Two thousand universities and colleges and a hundred thousand schools are not through effacing poverty and ignorance from the land. Churches are empty, waiting, and learning. Hate is not forsaken; the old bigotry masked in religion is publicly abandoned; but, racism remains. Education is more prevalent than ever; the lowering of intellectual level and the lowering of taste are surprising. All these constitute pressures on living in 1969, for which there is relief. Some history of our community, some telling of fears that hurt our Lodge, are brought to your attention for comprehension of the benefits of charity and benevolence. Charity Lodge members would be dull fellows were they ignorant of fears generated today and from the time of the workmen of the cathedrals. Among Masons, charity prevails, truth triumphs. Masonry holds for universal religious liberty, for education, dignity, and happiness of the human person. The navigation of our predecessors in Masonry rates as good sailing. Our predecessors regarded themselves as trustees; trustees of the Creator's bounty as to worldly goods, body, intellect, earthly happiness, and Masonic heritage. Our founding fathers mark us; and by Charity our Lodge lives. The history of Charity Lodge A.F. & A.M. presents itself in different clothing, to each thinking member. Through history, through Masonry, to each his own balanced way. Sit in a Lodge with a Scandinavian; he sees or hears with Sibelius, snow, sun, wind, and summer bliss, panorama, vast forces, and man; he reminds that Jan Sibelius served as Grand Organist of the Grand Lodge of Finland, in our life time. A Scotsman recites Robbie Burns. An Albertan ignores existence before his initiation into Masonry. In a Lodge room, a Brother may sense, but he does not know a fellow's thinking. The best known facts of Lodge history, establish that initiation into Masonry turns up a serene, Alberta like sky, with mountain peaks beckoning; and brings music and poetry into living. Lodge life is an open book. Masonic lives are open, outgoing lives. We are a secret order in the sense that our strength is in the quiet of the individual, that we abhor the self-advancement which exploits others, that our ritual and its organ music paean harmony and benevolence. Upon initiation, Masons experience the harmony which remains with them, their lifetime. Some find a harmony like to one of those harmonies Mozart wrote into music, when admitted into Benevolence Lodge in Vienna; at times announced in a Lodge room in the playing of the Magic Flute, or a welcome, or Psalm Hundred Twenty Nine, or other themes of Mozart. Companions of my social joy. Burns, the Scotsman, and Mozart, the Austrian, hold the affection of Masonry world wide. Like good music, like some poetry, Masonic ritual presents balance, reiteration, and variation of harmonies, throughout a Mason's life. Square, compass, and plumb, make harmony and sense; these common tools of Masonry, interdict mediocrity. Understanding this, comes from much living or from much instruction. We, in Charity Lodge, travel the shorter, less hurtful road to this wisdom; this road lies with Masonic instruction. Charity Lodge A.F. & A.M. teaches the lesson of victorious living. Our history sings a song of the triumph of Masonry. In this day, we 329 members of Charity Lodge A. F. & A. M. tell the friendship and brotherly love of Mason for Mason and of Mason for mankind. In 1869, members from the Masonic Lodges in Cambridge, Arlington or at that time West Cambridge (Arlington became a town in 1869) and Somerville joined together to form Charity Lodge which met at the old Post Office just down the street on Massachusetts Avenue in Porter Square. Charity Lodge with her age is the only true north Cambridge Lodge. Since her birth she has stayed within two blocks of our present location. On June 23, 1981, Mizpah and Faith Lodges were merged here at Cambridge by Most Worshipful J. Philip Berquist. The Officers of Charity Lodge, North Cambridge, were publicly installed by Grand Master Nickerson on Tuesday evening, Dec. 17, in the presence of a large collection of Brethren and ladies. At the conclusion of the ceremonies the company was addressed by the Grand Master and members of his suite, after which the Brethren with their ladies and guests sat down to an elegantly spread supper in the hotel of the village. The occasion was an agreeable one, and we are pleased to learn that the Lodge, though among the youngest in the District, is in a healthy and flourishing condition, with encouraging prospects of continued success. R. W. John Viall, D. D. G. M., Seventeenth Masonic District (Not as far as I can tell! ), assisted by W. Charles E. Bowers as Marshal, installed the following officers of Charity Lodge, F. and A. M., in the hall in Porter's Hotel: W. M. Horace E. Boynton; S. W. Frank M. Howe; J. W. Francis Ivers; Treasurer, Dan. W. Shaw; Secretary, Thomas T. Ferguson; Chaplain, Rev. W. A. Start; Marshal, Alonzo R. Smith; S. D., F. A. Freeman; J. D., John F. Ricker; S. S. Eugene Kractzer; J. S., K. S. Marshall; Organist, Luke B. Hapgood; I. S. Laclin Wallace; Tyler, A. E. Long. After the installation, R. W. Theo. N. Foque, P. D. D. G. M. presented W. B. David Hour, the retiring Master, with a jewel. At nine o'clock, the brothers and guests, with their ladies, to the number of about two hundred and fifty, sat down to a supper, and at 10.30 returned to the hall, where dancing, to the music of Edmands's Band, was enjoyed. During the year 1994 Charity Lodge of Cambridge celebrated its 125th Anniversary. 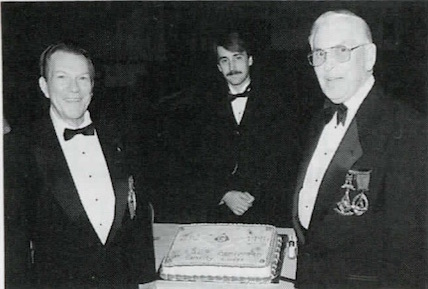 On May 2, 1994, as part of the celebration, the Lodge Raised Bro. Matthew Justin Von Bencke, a student at Harvard University. Assisting in the Degree work was the Harvard Lodge and a representative from every Lodge in Cambridge filling the chairs. Representatives from Charity Lodge's mother Lodge, Mount Olivet Lodge, were present, as well as Amicable Lodge and Columbian Lodge. Pictured with the anniversary cake: R. W. Earl G. Veino, Senior Deacon: Wor. Keith C. MacKinnon, Master; and R. W. C. Ralph Dixon, Chaplain.